Gustav MAHLER: Symphony No. 4 in G Major (1899-1901), arr. Erwin STEIN (1921); Lieder eines fahrenden Gesellen (1883-85), arr. Arnold SCHOENBERG (1920). Christine Brandes (sop. ); Susan Platts (mezzo sop. ); The Smithsonian Chamber Players, Santa Fe Pro Musica, Kenneth Slowik (cond.). Dorian DOR-90315 (http://www.dorian.com/). An enchanting release offering alternate and compelling versions of two Mahler works: The Fourth Symphony has been reduced to soprano, flute doubling piccolo, oboe doubling English horn, clarinet doubling bass clarinet, two violins, viola, cello, double bass, piano, harmonium and percussion; the Lieder eines fahrenden Gesellen whittled to voice, flute doubling piccolo, clarinet, two violins, viola, cello, double bass, piano, harmonium and percussion. 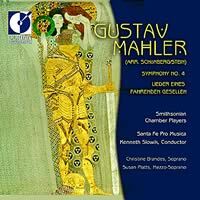 Of all Mahler’s symphonies, the Fourth is the least ostentatious. Containing many of his simplest, most delicate pages, it concludes with a child’s depiction of heaven, all the lighter in this chamber-ensemble reduction Erwin Stein made for Schoenberg’s Society of Private Musical Performances. One needs but a moment to get used to the intimate café texture whose Viennese litheness underscores the exquisite Schubertian opening dip. This is a wonderful way to experience the Fourth. My admiration of Stein’s superb arrangement grows on every hearing. Piano and wheezy harmonium keep to a subtle minimum, and trumpet lines on oboe or clarinet are not jarring. (Mahler’s original dispenses with trombones and tuba, contributing to the work’s airiness.) The weight of the single double bass provides a good foundation, and Stein’s percussion includes sleigh bells, of course. The string quartet plays the Smithsonian’s set of Amatis strung with gut. The scordatura solos of the second movement are played on a modern instrument with metal strings, further emphasizing the devilish fiddle. Schoenberg’s arrangement is less ingenious. Whittling down Lieder eines fahrenden Gesellen probably required less inspiration than tackling the Fourth. The expressive range is diminished, especially in the third song, “Ich hab’ ein glühend Messer in meiner Brust,” which doesn’t burst out wildly with these smaller forces. However, the funereal mood of the concluding “Die zwei blauen Augen von meinem Schatz” hits the mark. The voices loom large over the instruments. Without the backing of the full orchestra they’re also exposed, every nuance to the fore. Christine Brandes (soprano in the Fourth) and Susan Platts (mezzo in the songs) are an excellent match to the reduced ensemble. The female voice makes sense for Lieder eines fahrenden Gesellen, its tessitura carrying over the instruments. After a few listens, I prefer this reduction over the original! Even a solid recording, such as the Cleveland Orchestra under Dohnanyi with Dawn Upshaw (London 440 315-2), sounds starchy. It’s a great loss that Mahler left scant chamber music. I can imagine him tossing off a string quartet much as Verdi did when a needed singer was indisposed. This fine-sounding Dorian disc is a definite must for Mahler fans, and those others who have been put off by Mahler’s propensity for the ponderous. Péter EÖTVÖS: zeroPoints (2000). Ludwig van BEETHOVEN: Symphony No. 5 in C Minor, Op. 67 (1808). Göteborgs Symfoniker, Ensemble Modern, Péter Eötvös (cond.). Budapest Music Center Records BMC CD 063 (http://www.bmcrecords.hu/). How can anyone listen to Beethoven’s Fifth objectively? Here’s a fresh account from an unexpected corner. The Ensemble Modern is known for contemporary music. We’ve seen mention in these pages of their recordings of Rihm, Zender, Holliger and Goebbels, to name only several. Gentle electronic amplification balances the small body of strings against the winds. What a refreshing sound! One hears a greater focus and vivacious energy, with the violins sometimes rushing before tuttis, the whole, notwithstanding, convincing and sensible. Péter Eötvös’ zeroPoints is the result of a commission from the London Symphony and Pierre Boulez. Eötvös, a close Boulez colleague, knows the master flaunts convention by numbering his measures beginning with zero instead of one. Perhaps Boulez mimics Babbitt, who instigated serial music pitch numbering beginning with zero, with zero-to-eleven facilitating the complex math necessary to crack the code. However, measures starting at zero might momentarily confuse musicians. to 0.9, without ever reaching the number 1.” It’s a short and acrobatic work for full orchestra enriched with saxophones and pitched percussion. I hear similarities with Boulez’s flamboyant Notations. The wind scoring has a French flavor suggesting Messiaen and Dutilleux. The nine movements run without a break. The Göteborgs Symfoniker sparkles under Eötvös’ baton. Eötvös has added fanciful touches reflecting aspects of sound recording. Frequently the dense texture gives way to what he calls “tape noise,” a hiss produced with double bass tremolos (sometimes I hear cymbals too). The work opens with a high clarinet note, aping the 1kHz countdown signals used in film scores. The work closes enigmatically with a lone xylophone returning to the same pitch. With its fascinating cover photos, this is another attractive BMC release; however, a playing time under 50 minutes might pose a tough purchase decision. While Eötvös aficionados won’t be deterred, another contemporary work would probably have clinched the deal for new-music fans. 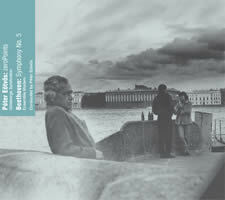 Further, who needs another recording of Beethoven’s Fifth? If you really were shopping for one, would you take your chances with a group that identifies itself as modern? BMC should push this recording’s novelty aspect, with “amplification” stated right there on the cover. I call that a compelling distinction. My only real problem is where to file this release: under “E” for Eötvös or “B” for Beethoven? Anton BRUCKNER: Symphony No. 9 in D Minor (1887-96, Nowak ed. ; Finale compl. by Nicola Samale, John A. Phillips, Benjamin-Gunnar Cohrs, Giuseppe Mazzuca, 1983-91, rev. 1996). New Philharmonic Orchestra of Westphalia, Johannes Wildner (cond.). Naxos 8.555933-34 (http://www.naxos.com/). First off, whatever Bruckner’s hazy final words may have been, his Te Deum is a lousy conclusion for the incomplete Ninth, like ostrich feathers on an elephant. I prefer my Ninth unfinished, ending with the Adagio. An acolyte “borrowed” and then mislaid the almost-final draft of the symphony’s Finale. Working across several decades, scholars, musicologists and conductors have sifted through reams of pages to realize a performing version. It’s evident that much of the coda, Bruckner’s last word, is lost to us. There are in fact two leading versions of the completed Finale, this Samale-Phillips-Cohrs-Mazzuca and one by William Carragan, for which go to Yaov Talmi and the Oslo Philharmonic on Chandos CHAN 8468-69. So now, if you like, you can turn three tragic movements into a regular four-act job. Wildner and the New Philharmonic Orchestra of Westphalia (why does this German orchestra’s name appear only in English?) give an assured yet restrained performance. It’s not as exalting as the typical Karajan, defiant like Abbado and the Wiener Philharmoniker (DG 289 471 032), or depressing as Davis’ recent with the London Symphony Orchestra (LSO 0023). Bruckner diehards may give up altogether after a few minutes. There’s little passion and grandeur. No exalted mountaintops. This is a Ninth for a subterranean data-storage warehouse. The first three movements keep to one disc. Disc two gives us the 23:28 Finale. Just knowing that there’s a fourth movement affects the first three’s pacing and balance. Without the Finale, the Adagio takes on immense heft and stature. Lots of extramusical weight surrounds a symphony’s last movement, and the Ninth’s Adagio can shoulder the load. Here the Adagio loses its accustomed magnanimity, its energy and pathos, to blandness. 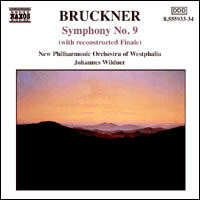 The reconstructed Finale is not an apex, a worthy summation of Bruckner’s symphonic life. The composer dedicated the symphony to God. What we hear fails to climb and soar, nor does it provide even moderate doses of rapture. It’s too episodic, starting and stopping abruptly. When the big moments hit, they feel tentative. Several uncharacteristic passages really don’t help: a recurring brass dissonance (7:45) and an Enescu-Romanian-Rhapsody-like progression (11:50). Definitely a lusher tone, a dash of afterglow, would have helped underscore this realization. By way of comparison, Talmi delivers the first three movements persuasively and with satisfying luminosity. Right off the bat, the tempo of Carragan’s faster and more intense Finale helps delineate background filigree from joyous strutting. The wispy opening is much more plausible as is the following skipping string figure. The troublesome brass dissonance of the Samale-Phillips-Cohrs-Mazzuca is smoothed over and the Enescu-like passage (11:12) is Valkyrian. The concluding chorale, peppered as it is with odd moments, still hints better at Bruckner’s intentions. The Naxos production seems defensive. Carragan’s alternate is never mentioned, and with the extra space on the second disc, we could have profited from musical examples or spoken commentary. The Chandos production provides 15:51 of Bruckner’s sketches (Carragan’s completion is 21:55), but no commentary. This bare-bones presentation slyly implies that Carragan wrote only connecting filler for the missing pages. Listen closely. It’s evident that the Samale-Phillips-Cohrs-Mazzuca orchestration differs from Carragan’s, the Chandos release implying that this is truer to Bruckner’s original. I wish Naxos had included something akin to what appeared on the BBC’s reading of the sketches for Elgar’s Third (NMC D053), or Slatkin’s comparison of the various Mahler Tenths (RCA 09026-68190-2). Forgive me. I get carried away by minutiae. Dmitri SHOSTAKOVICH: Symphony No. 7 in C Major, Op. 60, “Leningrad” (1942). 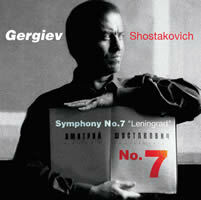 Kirov Orchestra, Mariinsky Theatre, St. Petersburg, Rotterdam Philharmonic Orchestra, Valery Gergiev (cond.). Philips B0000376-02 (http://www.universalclassics.com/). Do we really need another stab at Shostakovich’s Boléro? The symphony’s most striking feature is the first movement’s interruption, an intentionally mindless nondevelopment of a naïve ditty over an equally banal accompaniment. To Gergiev’s credit, it’s less frenzied than it might have been, though still loud and intimidating. The violins pour vigor into the opening notes. They’re telling us to buckle up for a long ride. This and other places reveal that Gergiev has paid attention to the whole shebang and not just the first movement’s extraneous pages. Miraculously, the last movement has become bearable. Looking past the “Leningrad”’s undeniably exciting provenance, other symphonies possess more inspiration (though nowhere near the same perspiration). Nos. 11 and 15, the late song symphonies, and even the warhorse Fifth are better products of Shostakovich’s perpetual balancing act and well-honed ironic style. Gergiev brings out touches of other composers. There’s a bit of balletic Prokofiev in the second movement’s central outburst and the subsequent flute and harp oasis. The third movement’s opening wind chords blatantly copy neoclassical Stravinsky: Symphony of Psalms was one of the few scores Shostakovich took when he fled Leningrad. No explanation is given for the two orchestras. Philips’ website reveals that the Kirov and the Rotterdam Philharmonic combined for this live recording. Solo lines are not doubled, and it’s hard to tell what if any augmentation has been made to the tuttis, though this might account for the brazen opening string sound. The low brass is unexpectedly full-bodied. More details about the combined venture would have been welcome.